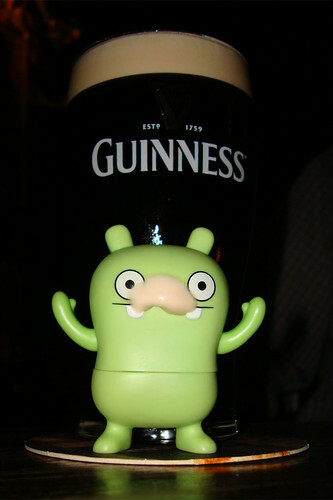 Uglyworld #298 - Jeero Samples Some Guinness (17/365), originally uploaded by www.bazpics.com. Today we took Jeero into Aachen to meet one of his friends who kindly offered to take him on a wee mini holiday to Paris for a few days. As you can imagine he was already sooooo excited about getting to visit Paris even before we left the house, and by the time we arrived at the Guinness House in the city he was almost bouncing off the walls. He said that such an occasion required a nice toast, and so he nose-dived into a pint of Guinness while shouting, "Wooohoooo, I'm going to Paris!!!". I look forward to seeing what he gets up to while away with Carmen (who he said is now his bestest friend for offering to take him along).